Profit & Loss Income Statement is one of the major financial statements used by every business. The income statement is important because it shows the profitability of a company. 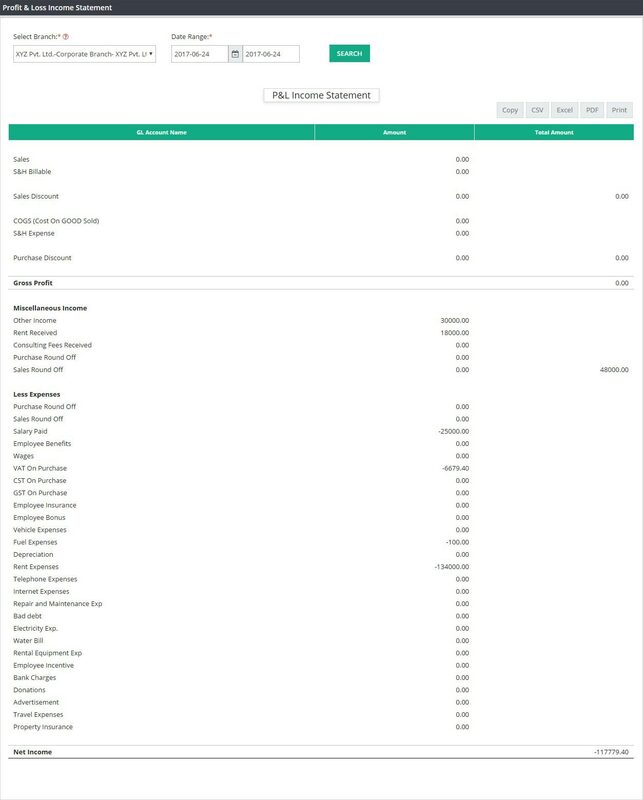 Please note that the income statement shows revenues, expenses, gains, and losses; it does not show cash receipts (money you receive) and cash disbursements (money you pay out). You will be using this screen to see Gross Profit and Net Income. Select Branch : Please select the branch name if you want to run your P&L Income statement for a branch. Please select ALL for all branches. If you are a single branch company, name of the company will appear here. No need to select anything. Date Range : Please select the accounting period for which you are running this Profit & Loss – Income Statement. Like- April 1st 2016 to March 31st 2017. Please click on Submit. P&L income Statement will be generated for that period. Statement will display – G/L Account Name and Amount. You can copy or save this report to Excel, CSV or PDF file directly from this screen. If you want to print the report, please click on print.